Ireland came into this game in a confident state of mind, their second in the 2007 World Cup, following a dramatic tie against Zimbabwe. It was St Patrick’s Day, the day of the Irish patron saint. On the other hand, Pakistan had to win to stay in contention. What followed was one of the most shocking upsets seen in the game. Trent Johnston had no hesitation in putting Pakistan in on a green-top, and they were soon 15/2. The ship seemed to be steadying at 56/2 in the 13th over, but from thereon began a procession of wickets. The greenhorn Irish pacemen, Boyd Rankin (3/32) and Andre Botha (2/5) in particular, reduced the Asian giants to 72/6. Kamran Akmal attempted a recovery but he managed only 27, as Pakistan were skittled for a scarcely believable 132 in 45.4 overs. Remarkably, all ten batsmen were out caught. Chasing a revised 128 off 47 overs in reply, Ireland too became 15/2 when Niall O’Brien came out to bat. The wicketkeeper proceeded to play the innings of his life, scoring 72 in 107 balls. It seemed like a comfortable win at 108/4, when O’Brien was out stumped. This triggered a mini-collapse, and at 113/7, Pakistan were right back in it. Johnston joined Niall’s brother Kevin, and the duo made sure there were no further hiccups, reaching 133/7 in 41.4 overs, with the captain fittingly getting the winning runs with a six off Azhar Mehmood. This sparked off frenzied celebrations at Sabina Park – Ireland had qualified for the Super 8, while Pakistan were eliminated after just two games. Ireland claimed their second big scalp of the 2007 World Cup in this Super 8 game, which was inconsequential as both teams were out of the semi-final race. After deciding to bat, Ireland got off to a solid start, the openers William Porterfield and Jeremy Bray putting on 92. Porterfield went on to make 85 off 136 balls, while Kevin O’Brien’s 44-ball 48 ensured a healthy total of 243/8. Bangladesh then got off to a scratchy start and never quite recovered after being reduced to 48/3. The top score was Mohammed Ashraful’s 35 as all five Irish bowlers bagged at least a wicket. The innings came to an end in 41.2 overs, Bangladesh bowled out for 169. This win, Ireland’s second over a full member, ensured permanent ODI status for them. Bangladesh paid a visit to Ireland for a two-ODI series, this being the first of them. Ireland showed how much they have improved, scoring a highly professional and convincing 7-wicket win. After Bangladesh were reduced to 28/3, Junaid Siddique (100) and Shakib al Hasan (50) put on 107 for the 4th wicket. However Ireland always stayed in control, and tight bowling at the death kept the visitors to 234/9, Boyd Rankin (3/43) and Trent Johnston (2/24) being the best bowlers. In reply, captain William Porterfield again displayed his fondness for the Bangladeshi attack, putting on 118 for the opening wicket with young Paul Stirling (52) en route to a masterful 108 from 116 balls, and then a further 90 for the 2nd wicket with Alex Cusack (45*). Ireland reached 235/3 with 5 overs left, recording their first win over a full member on home soil. The World Cup seems to bring out the best in the Irishmen. If the 2007 win over Pakistan signalled Ireland’s arrival, this heady victory over the old enemy showed that they were more than just giant-killers, and could upset any team on their day. 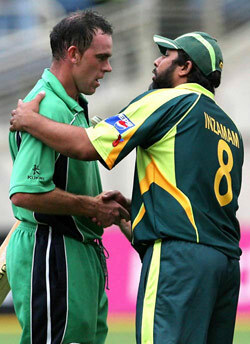 This win, is till date Ireland’s most memorable in international cricket. England decided to bat on a flat track and were immediately all over the Irish bowlers, openers Andrew Strauss and Kevin Pietersen (59) galloping to 91 in the 14th over. Part-time spinner Paul Stirling got rid of Pietersen to make the score 111/2, but that only brought together Jonathan Trott (92) and Ian Bell (81). The duo added 167 for the 3rd wicket and England were set for a mammoth score, before Ireland fought back a bit, claiming the last six for 49 in 7 overs, John Mooney being the pick with 4/63. England ended with 327/8, and Ireland needed something special to chase it. The chase got off to the worst possible start as captain William Porterfield was bowled by James Anderson off the very first ball. Ireland rallied to reach 103/2 in the 21st over, but Greame Swann’s (3/47) triple strike derailed the middle order, and the score read 111/5 in the 25th over. England’s victory seemed like a mere formality. And then true Irish spirit came to the fore, in the form of Kevin O’Brien. The all-rounder turned the game on its head, and how. He reached 50 in just 31 balls, and then galloped to 100 off a mere 50 balls – in the process shattering Matthew Hayden’s record of the fastest World Cup hundred (66 balls). Cashing on England’s poor fielding and shoddy bowling (33 extras were given), he blitzed his way to 113 in 63 balls, with 13 fours and 6 sixes and put on 162 for the 6th wicket with Alex Cusack (47) to stun the opposition. He was finally run-out in the 49th over, by which time his team needed only 11 more to win. Mooney made a valuable 33* and also struck the winning boundary, as Ireland reached 329/7 with 5 balls to spare. This win was the highlight of the tournament, and the defeat of England brought immense joy to Ireland’s passionate supporters. Ireland, who were out of reckoning for a quarterfinal berth, signed off their 2011 World Cup campaign with a victory, chasing down a 300+ once again. William Porterfield put in the Dutch, and the decision seemed justified when the score was 53/3. However, Ryan ten Doeschate made an impressive 106, putting on 121 for the 5th wicket with skipper Peter Borren (82*). Netherlands were bowled out for 306 in 50 overs, the last four wickets all being run-outs in the final over. Any doubt of Ireland chasing this big total was removed by openers Porterfield (68) and Paul Stirling, who amassed 177 for the first wicket in just 27 overs. Stirling creamed 101 off just 72 balls, while Niall O’Brien kept things boiling with an unbeaten 57. The target was rather comfortably achieved, the final score reading 307/4 in 47.4 overs.